You can achieve a lot of benefits from reloading your own shotgun shells, from cost savings to increased performance. Shotgun shell reloading is a little different than reloading regular pistol and rifle ammunition because it adds an additional component, the wad. While you can potentially set up a normal single stage press to reload shotgun shells, you will be much better off getting a specific shotgun shell press. If you are ready to enjoy the benefits of reloading your own shotgun shells, check out these reviews for the best shotshell reloader. Most people want to know, how much money can I save by reloading my own ammunition? In the case of cheap economy shells that you can buy from the big box stores, you will not be saving enough money to justify reloading. These bulk pack target loads are made with soft shot, cheap wads, and cheap powder that often result in poor performance in shot pattern and reliability. While you may not be able to reload shotshells and save a lot of money when compared to these cheap economy rounds, you will be able to shoot a much higher quality of shell for the same price. When it comes to target loads, you can reload shells with a harder shot which will give you a more consistent pattern. You can also shoot lighter loads to reduce recoil for those extended practice sessions. When comparing the price of target loads, if you consider the quality of the ammunition, reloading your own shotgun shells is well worth it. Some of the premium hunting ammunition can cost around $20. This is where reloading your own ammunition results in significant price savings. Not only can you save a lot of money reloading these rounds, but you still get the benefit of improved quality. You can tweak a load so it works best out of your shotgun. Instead of cycling through all of the different brands and shot sizes trying to find a shell that patterns well, you can simply adjust it yourself. This can give you excellent patterns that can be tuned for close range or long distance, and that are more consistent than store bought shotgun shells. If you are looking for a way to improve your accuracy and performance in the field, reloading your own ammunition is a great choice. The Mayville Engineering 600 JR Mark V is a very well-reviewed and recommended product when it comes to shotgun shell reloading. In fact, the manufacturer claims that it is the world’s #1 selling shotshell reloader. The 600 JR Mark V is a single stage shotgun reloader that comes in a variety of calibers from .410 up to 10 gauge. This particular press is for reloading 2-3/4 and 3 inches 12 gauge shells. You will not get the capacity from a single stage press that you could from a progressive, but with practice, you should be able to reload approximately four to six boxes an hour with this press. The priming feature for this press is built in but is easily upgradable with the MEC 285 CA primer feed to be automatic. One downside to this press is that it is not ready out of the box to reload steel ammunition. However, you can buy an adapter to be able to reload steel shot. The press comes with a charge bar for 1-1/8 ounce. Overall, this is an excellent setup for getting started with shotgun reloading. As long as you are not shooting hundreds of shells a day for trap shooting, the output on this press should be just fine. 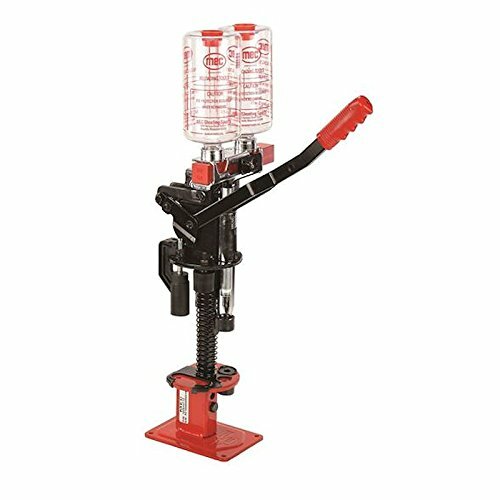 The Lee Precision II Shotshell Reloading Press is an excellent choice for the budget conscious reloader or beginner. It does not come in as wide of variety of calibers as some of the other brands, but they have 12, 16, and 20 gauge models available. This press is the 12 gauge model and can reload 2-3/4 and 3-inch shells. The manufacturer states it is capable of reloading 200 shells per hour which works out to be eight boxes, although actual users found it to be significantly slower than that. A nice feature of this press is that the priming feature is built-in and has a primer catcher that is easy to access and empty. Additionally, the hopper holds up to 5lbs of shot which gives you enough to continuously reload for around 30 minutes. However, the feature that stands out most on this press is the eight shot bushings and sixteen powder bushings. These are not usually included, even with some of the more expensive shotshell reloaders. It also comes with a steel sizing ring, a safety charge bar, and a 6 and 8 point crimp starters. If you are just getting started with shotshell reloading, you should consider buying the Lee Precision II Shotshell Reloader. It is an excellent press that will get you started reloading shells at a fraction of the cost of some of the other name brands. 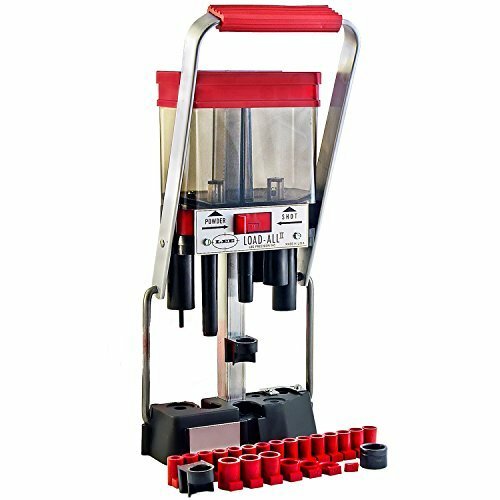 If you are looking to reload a larger quantity of shells, or if you just don’t have the patience to reload one shotshell at a time, then consider purchasing this MEC progressive press. It comes in 12, 16, 20, 28 gauge, and .410 bore. From the factory, this is set up to reload 2-3/4 inch shells but can be converted to reload 3-inch shells as well. This might be a downside when comparing to some of the single stage reloaders, but consider that this press is meant for high-speed, high-volume reloading and most people just don’t shoot that many 3 inch shells. Features include automatic indexing for quick reloading, and shells are automatically ejected once they are finished. Once you get the press setup, you will be reloading a finished shell with every upstroke of the handle. If you shoot a high volume of shells and want to get started reloading, check out this MEC progressive press. Reloading shotgun shells can be a very rewarding task. Not only do you save money, but you can end up with vastly superior ammunition. From a budget option to top of the line equipment, you should find something that suits your needs out of these shotshell reloading presses. If you are just getting started with reloading, the Lee Precision press would be a great place to start. It will keep your initial investment costs low, and give you a great entry into the world of shotgun shell reloading. If you are looking for some nicer equipment, the MEC Single Stage reloader is a good choice. It will last you a lifetime of reloading and has some really nice features. The MEC Progressive press is another great option and is meant for reloaders who are looking for high output. Choose the best press for you and get started reloading your own shotgun shells.